Meet Alicia, a 3rd grader at Beulah Baptist Christian Day School. Alicia loves math and spending time at Chuck E’ Cheese’s on her days off. Her mother, Cherita, credits the education Alicia receives at her private school with Alicia’s academic success. In the above photo, Alicia was awarded a bible scholarship and an award for outstanding achievement and citizenship. Way to go Alicia! A: I like to go to Chuck E’ Cheese’s and spend time at the arcade. A: Math because I like to work with numbers. A: The Lord because he helps me and I will never forget. A: A gymnastics performer because it’s fun to be! A: I would like to learn more math. A: I hope that my daughter lives an educational and good life. I hope she has the ability to overcome any obstacles. I hope she is the head leader one day. A: Her school is the best because she is learning things new to her and progressing well to tackle the tough ways in life. She is happier now than before. A: Tuition based schools are more secure, in terms of safety, and that keeps Alicia focused on her books. They help because of the push in educational learning. She’s no longer stuck or unable to learn. A: That this was a big opportunity for my child to do the best in life. 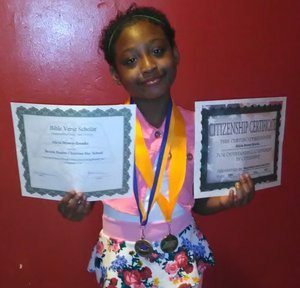 My daughter needs this scholarship to help her grow up to her potential. She a wonderful kid and is thankful for all. A: This scholarships affects us by giving us a reliable source of hope for Alicia to have a good life and to bless others and herself. A: I will recommend this program to many because of the great time I have had. From the help, awards, and to now I will tell people about this program.